2 weeks left to submit! 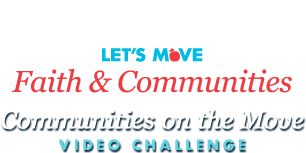 We're coming to the final weeks of the Communities on the Move Video Challenge. It's not too late to enter — start shooting your video today! Let's Move! wants to know how your organization is helping reverse the trend of childhood obesity. Your video could inspire many others, and if it wins, offer the opportunity to meet the First Lady at the White House later this year. Your video is 1-3 minutes long. Your video describes how your organization has worked to improve the wellness of children in congregation(s) or community(ies). Your video focuses on at least one of the following topics: healthy eating, physical activity, and/or access to healthy, affordable food. Your video directs viewers to www.letsmove.gov for more information. This can be a text overlay. Read the full rules, and don't forget the most important part: have fun with it! Round up friends, family, and members of your organization to be in the video. We look forward to seeing your submission!